The cuneiform script can seem bafflingly complex at first. This section aims to demystify it, by explaining how cuneiform developed over three thousand years, how it was used, and how you can learn it. We also provide a short introduction to the Akkadian language, which was written in cuneiform script, and suggest ways to continue learning. 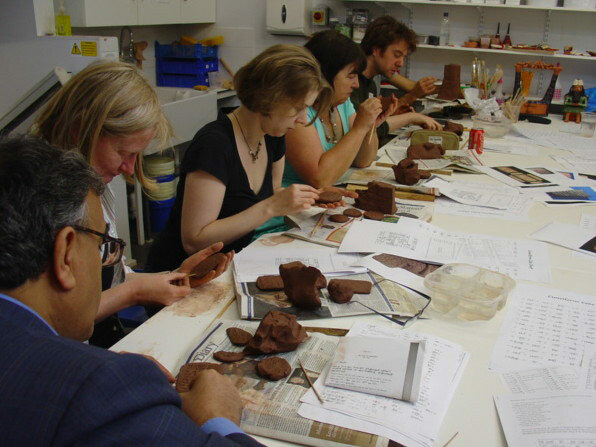 People writing tablets at a clay tablet workshop in September 2008, organised by the Enheduanna Society and sponsored by Birkbeck College, the British Institute for the Study of Iraq, and Holborn Community Development Project. Photo by Frans van Koppen. View large image. Use the links below or the menu on the left to find out more. 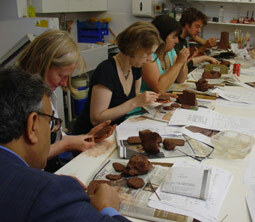 About cuneiform. These pages describe the origins and development of cuneiform script; how it worked; and modern conventions for representing it alphabetically and digitally. Tablet gallery. This section illustrates some of the many hundreds of thousands of cuneiform tablets in the collections of the British Museum. These letters, administrative records, royal inscriptions, library tablets and legal documents from three millennia will give you an idea of the many different shapes and styles in which clay tablets were produced and highlight how the cuneiform script changed over time. Learning signs. Here you will find reference lists of cuneiform signs; tips on learning and memorising them; reading exercises and their solutions; and tips on using sign lists and the Unicode Cuneiform character set. The Akkadian language. These pages describe the basic elements of the grammar of Akkadian - how words are put together (morphology), and how they relate to each other (syntax). There is also a short reference list of Akkadian vocabulary. Texts to read. To practice reading real cuneiform, these pages give you photographs of selected laws of king Hammurabi. You will also find transliterations, normalisations, and translations of each of them, to compare with your own readings. Cuneify. The Cuneify facility, developed by Steve Tinney, turns alphabetic transliteration into cuneiform script. You can use this as a teacher, to create reading exercises for your students in Old Babylonian or Neo-Assyrian script, or as a learner to explore the complexities of the cuneiform writing system for yourself. Further reading. This section provides bibliographical references, and if available download options, for books and articles on cuneiform and Akkadian which you may find useful to further your studies. It also lists all the the books and articles quoted on these pages. Help with fonts. How to install and manage the cuneiform and transliteration fonts you need to make the most of this website (and of learning cuneiform!). This section of the website was developed in the summer of 2009, funded by the Higher Education Academy's Subject Centre in History, Classics, and Archaeology [http://www.heacademy.ac.uk/hca]. We thank Dr John Curtis and Dr Jonathan Taylor of the Middle East Department [http://www.britishmuseum.org/the_museum/departments/middle_east.aspx] of the British Museum [http://www.britishmuseum.org/] for their generous help in developing the Tablet gallery. Content last modified on 05 Dec 2016.